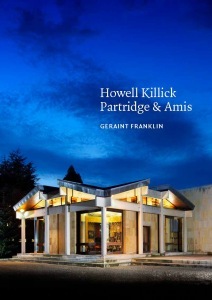 Howell Killick Partridge & Amis (HKPA) was established in 1959 by four young architects who worked together at the architect’s department of the London County Council. Over the next two decades, the partnership of Bill Howell, John Killick, John Partridge and Stanley Amis became celebrated as one of the most creative and idiosyncratic of Britain’s post-war practices, lauded in the architectural press and attracting the opprobrium of mainstream modernists such as Nikolaus Pevsner. Although HKPA are particularly identified with the expansion of higher education following the Robbins Report of 1963, their workload ranged from lavish private residences to housing schemes via theatre, civic and industrial buildings. HKPA’s exploitation of dramatic forms and expressed construction earned them a reputation as exponents of the ‘New Brutalism’. They developed a bold visual language which contrasted the texture of board-marked concrete with heavily-modelled pre-cast components. Yet they also designed in brick, timber and stone, and the versatility of their approach shows in a telling sensitivity to landscape sittings and historic context. Architectural concepts were often expressed in terms of physiological analogies—the ‘erupted skin’ and ‘vertebrate buildings’—thus continuing a long tradition of architectural metaphors of the body. The author also traces the evolution of HKPA’s architectural language in later buildings such as the Hall of Justice in Port of Spain, Trinidad and Tobago, and Chaucer College, Canterbury. The book draws upon hitherto untapped sources, including the practice’s private archive and interviews with the surviving partners and others. Broadly structured by building type, the book will reveal the design principles and influences behind HKPA’s work, placing their oeuvre within the shifting context of post-war architecture and tracing critical reception and lasting reputation. The book will also profile the partners’ individual roles and allegiances, including teaching at the Architectural Association, Regent Street Polytechnic and the University of Cambridge. An account of Bill Howell’s involvement with Congrès Internationaux d'Architecture Moderne (CIAM) and the formation of its successor is situated within the regeneration of the modernist project in post-war Europe. 1 Who were Howell Killick Partridge & Amis? This terrific set of books, masterminded by the Twentieth Century Society, is blasting apart lazy assumptions about the architecture of the period as being subsumed into dreariness by modernist dogma. Instead post-war Britain is seen as a country that blended a rich range of flavours, of which HKPA must surely be one of the more piquant. ... The quality that shines out most clearly from this excellent survey is the joyful pleasure the quartet took in the business of architecture. ... succinct, richly illustrated, and elegantly constructed survey. ...Franklin's incisive and sympathetic analysis of one of the most important architectural practices of the 20th century has been worth waiting for.